If you are using SQL Server Management Studio in SQL Server 2008, 2008 R2 or above, you can acces the previous versions of SQL Servers from the Management Studio as shown in the picture below. 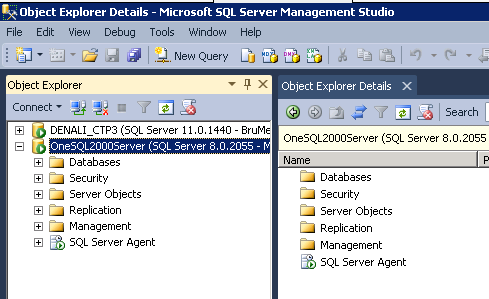 I am using SSMS in SQL Server Code-Named Denali (CTP 3) and I am connected to a SQL Instance of the same version as that of the Management Studio. I am also connected to another SQL Server which is SQL Server 2000. 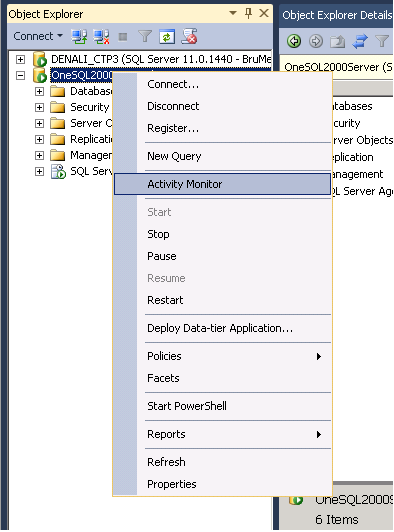 In order to open the activity monitor, I right-click on the connected server (SQL 2000 here…) and choose Activity Monitor from the popup menu. We get the following error indicating that we cannot access activity monitor of SQL Server 2000 instance inside Management Studio. The reason for this is, SQL Server Activity Monitor in SQL Server 2008 and above, utilizes the Dynamic Management Views (DMVs) introduced in SQL Server 2005. Whereas, activity monitor in SSMS 2005 is designed for backward compatible so that we can still be able to work with SQL Server 2000. This entry was posted in SQL Server Administration and tagged Activity Monitor, SQL Server Denali, SSMS by Brumedishetty. Bookmark the permalink.